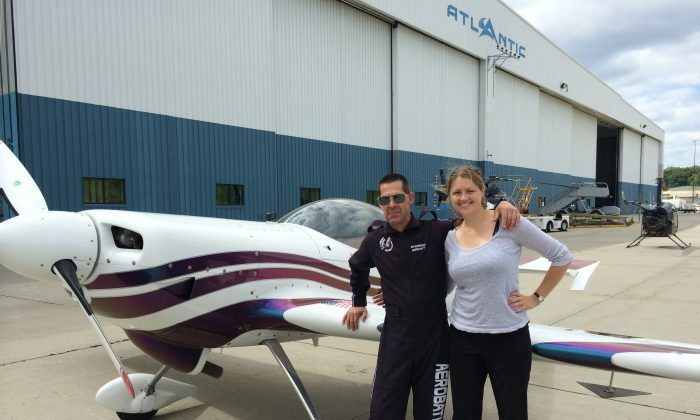 NEW WINDSOR, N.Y.—Flying with Andrew Wright, the pilot whose plane crashed Friday, Aug. 28 while practicing for the New York Air Show, was a truly amazing experience. I was at Stewart International Airport on Thursday, Aug. 27, to take pictures ahead of the New York Air Show, when the media coordinator offered to let me ride in one of the aircraft. I of course jumped at the opportunity, and she introduced me to Wright. Besides being a kind and genuine person, Wright, was an experienced pilot and a patient teacher. One of the first things I knew about Wright was that he was trying to set a world record for the most number of inverted flat spins, which is when the aircraft is upside down spinning parallel to the ground. He said he had already broken the world record of 81, but nobody from the Guinness World Records was there to witness it, so it didn’t count. His little Giles G202 aerobatic aircraft was one of the nimblest and gravity-defying machines I had ever seen. It was so small, the wind from a helicopter landing nearby sent it rolling, and Wright single-handedly pushed it back into place. The single engine, carbon fiber, monoplane could do things that I didn’t think were possible in the air. We did so many spins and turns, and many other things I can’t remember, sometimes I wasn’t sure which way was up and or down. The plane had two seats, one in the front for a passenger and one in back for the pilot. Each seat had a steering stick and Wright made the mistake of trying to teach me to fly while in midair. Needless to say, he gave up after I failed to execute a complete roll. I asked Wright if people ever saw that and got right back out, and he said most people would have figured it out long before they got in. Sitting in the front with Wright behind me, I couldn’t see over the nose of the plane to watch where we were going. He couldn’t either, much less with my head in the way, but he said after so many years of flying, he didn’t need to see where he was going. Once we were up in the air, I forgot my misgivings and gave myself over to the exhilaration of flying. I liked roller coasters as a kid, and I think that translated over when I took to the air. Flying with Wright made the Millennium Force seem like a kiddie ride, and I am sure Wright gave me a tame version compared to what he does when he is alone. He had three cameras attached to the plane: two on the wings and one facing me outside the cockpit. I never saw the footage, but I imagine for most of it I am screaming upside down with my hair standing above my head as we rolled and spun. When I got back to terra firma, it was kind of a relief. It was also the start of a very uncomfortable sensation—nausea. At that point I was glad I had missed lunch (Wright probably was too). He assured me I wasn’t the first to feel sicker after the ride then during, and I was fortunate I didn’t have to use the Ziploc. Wright said he had 12 air shows planned this year with the next one being in Atlantic City, New Jersey, on Sept. 2. This was just a part-time job that he did as a hobby; his full-time job was working as chief technology officer doing cybersecurity for a small company in Toronto. 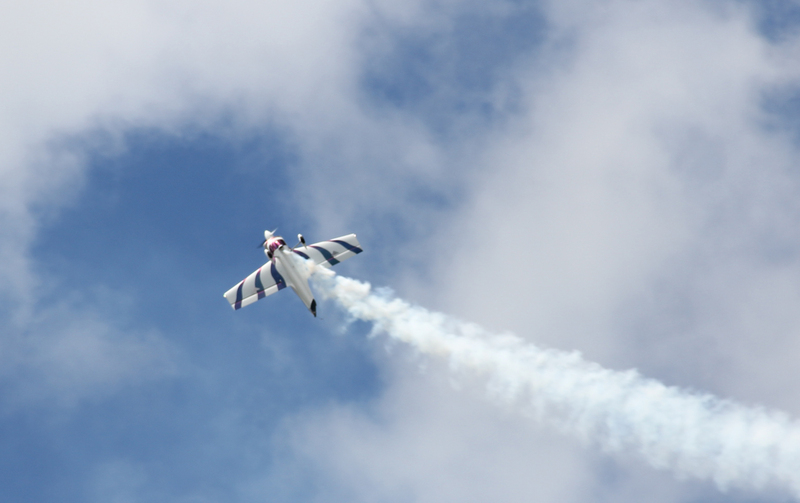 He got into aerobatics after his wife, who knew he was interested in flying, took him on an 1.5 hour blindfolded car ride to a glider field in Pennsylvania (they were living in New Jersey at the time). That was when he got hooked. He started flying seriously a few years after that, and the rest is history as they say. When I learned about Wright’s untimely death on Friday, it was shocking and heartbreaking. I had only known Wright for a few hours, but going through an experience like that, it made him feel like an old friend. It isn’t clear what caused his plane to crash, but photos show the tail detached from the body as it fell from the air. Onlookers said it looked like he steered the plane away from bystanders before it hit the ground, which doesn’t surprise me. From the little I knew him, he was an upstanding guy. 2015 Season Preview from Andrew Wright on Vimeo.